In 1982 I went to an exhibition in Edinburgh of work by a group of talented designers and architects collectively known as Memphis. Vibrant, fun, funky- they turned design on its head and way out of the 70's . They were the punk generation of interior and product design. The concrete box design that came out after the war and carried into the 70's , partly as a result of the Bauhaus movement was not what these ambitious and talented innovators had in mind. I had just moved to Edinburgh having spent a few years in a concrete new town full of roundabouts and clipped grass. I was now living in olde worlde Edinburgh and partying to the very eclectic music scene that existed. I think the same year I bought into Memphis I also bought a Charles Rennie Mackintosh poster which is now framed and in my diningroom. I still have my Cab Calloway and PIL albums- we're taking serious ecelecticism. 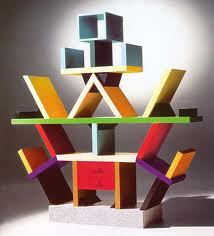 Ettore Sottsass was the leading figure of the movement. I remember Nathalie du Pasquier for her amazing patterns in fabrics and carpets. Lots of cheap materials, playful colours, fun and quirky. You'd struggle to find anything original on Ebay- it is serious collector material now. Interesting to me was looking back at early notebooks and seeing how often I used one piece in a design scheme. Forgotten how much I loved it!